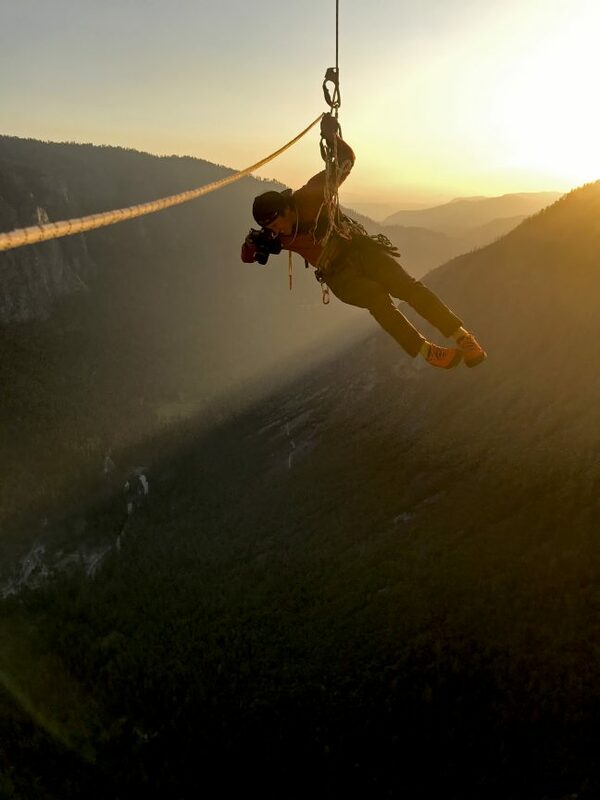 "Free Solo," a National Geographic feature documentary from the filmmakers behind "Meru," Elizabeth Chai Vasarhelyi and Jimmy Chin, is now in theaters. Elizabeth Chai Vasarhelyi and Jimmy Chin’s latest film, Free Solo, follows two years in the life of Alex Honnold, the best free soloist climber — i.e. someone who scales mountains without ropes — in the world. Chin himself has a 20-year history as a professional climber, and is a longtime photographer and filmmaker for National Geographic. Vasarhelyi has made six feature films. Together, they are the perfect pair to make this film. The award-winning filmmakers and couple previously co-directed Meru. To make the jaw-dropping film, Chin and his crew, all climbers themselves, dangled from the sides of El Capitan in Yosemite National park. Chai gave life to the storytelling through her keen vision for emotional arc and depth for Honnold and the subjects around him. Vasarhelyi is mixed race Chinese American, and both of Chin’s parents are from China. In an interview with CAAM, Vasarhehyi said that “our heritage is a part of who we are and how we look at things.” In addition, while mountain climbing is mostly male-dominated sport, the team was intentional about having Vasarhelyi be the lead director, as well as bringing on two women producers. It was a no-brainer that this would be an incredible story to tell. “Honnold is pushing the limits of human capacity and what’s possible. 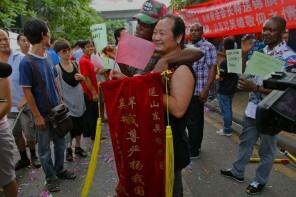 It’s an extraordinary story,” Vasarhelyi said. “But it’s risky, too,” she adds. “I’ve always been conflicted about shooting a film about free soloing just because it’s so dangerous,” Chin says in the film. [Spoiler Alert] In 2017, Honnold became the first man to free climb El Capitan, made of 3,200 vertical wall of granite. 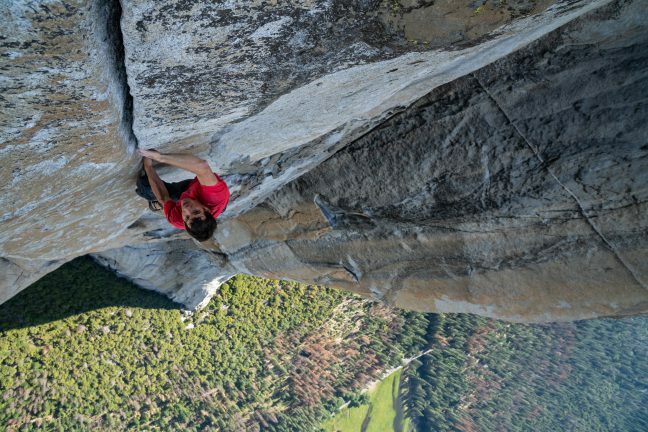 The film crew itself become subjects in the film, as they communicate with Honnold and grapple with the ethical aspects of making a film about a man who may fall to his death with any tiny mistake. The pair also had faith in Honnold. The film team went to lengths to mitigate any risk as much as possible. Any little mistake could result in loss of life — as one subject put it, it’s like participating in an Olympic sport, but if you don’t get the gold, you die. Making a documentary also meant they did not know what would happen, and they also would have to be at peace with the worst-case scenario. “No matter what, we trusted our own treatment of his story,” Vasarhelyi said. A line they decided to never cross is to ask Honnold when, or whether, he would climb El Capitan. “Then, one day, he told us he was going to do it,” Vasarhelyi said. Their high angle team is likely the best team they could have assembled to make the film; all are professional climbers. Honnold also knew them all, and trusted them. During the filming of the El Capitan scenes, the crew, as close as 15-20 feet away from him on a parallel course, scrambled (using ropes), as Honnold quickly ascended the wall, leaving the viewer with a sense that they’re with Honnold on his epic journey. The heart of the film is not only the climb itself, but the love story — of accepting someone whose life depends on taking risks. The people surrounding Honnold — his girlfriend, his mother, his friends, and the film crew itself, are also heroes themselves.